Christmas! The radio people are already talking about how many shopping days are left! I hope to get a few new designs up but it’s slow going. You can get this Jack design on tees at Neato and tees/cards/mugs/etc from Red Bubble. I’ll pass along shipping deadline info when I have it. This entry was posted on Monday, November 12th, 2018 at 12:00 am and is filed under BEAR NUTS. You can follow any responses to this entry through the RSS 2.0 feed. You can leave a response, or trackback from your own site. Did Lech’s broken thumb heal that quickly? Well Abdiel, assuming it didn’t actually break a bone you can reset a dislocated digit pretty fast. Of course that’s assuming he hasn’t torn ligaments and the like. Sickening abandonment he says, and yet I’m pretty sure he doesn’t have a problem being fed by the humans he detests. Everyone who said that i didn’t call it, well i called it! All i’m gonna say is that i called that this would happen the page before this one. No one get upset or be rude please, i want us to all be civil about this. But just so we’re all clear about his, i Totally called this happening. Aww! That’s too sweet of Gay. Will this end like in the “tension sexual no resuelta” movie? What kind of bears are the Bear Nuts supposed to be? A Kodiak could squash a lion and even a grizzly standing at six to eight feet would give a lion something to think about. I don’t remember reading about dwarf bears anywhere. If anything the reason why the bears are so small is because it’s a comic for fun, and they don’t have to be life sized. Who here bets that Lech is going to lose this fight? @connor Murphy They do have a classification I think “shenny nerd” said it, but yea i think they are just young because all of their mothers are of larger sizes buuuuut meh owo ???? I’ll take that Bet T-Shaw, because i know that either way Lech is going to lose this fight! Second its better they are small…. imagin how the comic could be if all the bear was like Prozac in his angry-mode…. it can’t be as fun that it is with our little cutie bears. It make them interesting ‘s and it’s a part of their personnality. So nope pleas no big and muscled bears…. and we can consider they are small cause of their young age even if personaly I consider them like teenagers close to be major (exepted Nerd and Tanked). 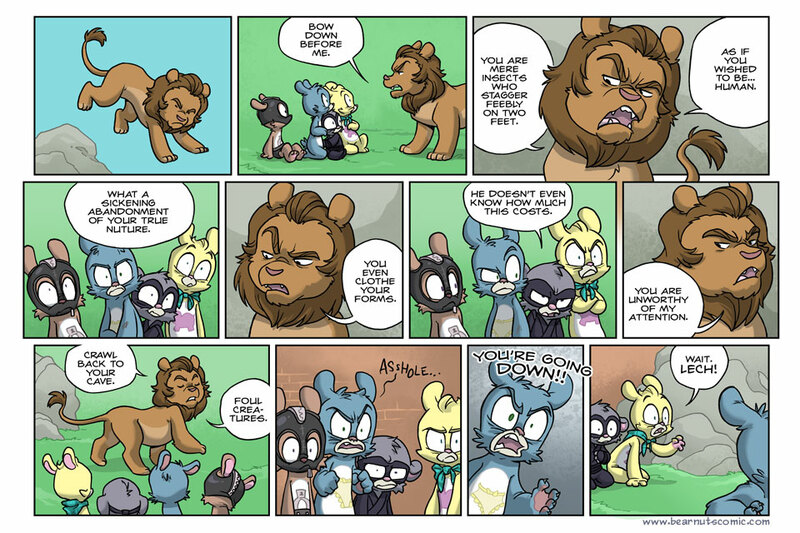 So all that for said that their size don’t disturb me, I like my favorite cartoon bears like that and this lion disgust me…. he his so… so full of himself, boastful and proud…. he critic the bears because they live like human but it seem not disturbing him to be closed in a cage and feed by these “patetic humans” like he seem told…. And he said be the king of the jungle but dude… you are in a Zoo juts in case or you hasen’t see you are king of nothing here XD and bears was be more usefull that you in this zoo! I realy hope our bears will give to this damn lion a greag lesson… even if it seem lose in advance but maybe Gimp will do something special , if prozac was here he has never let this lion said all that ! @ShennyNerd I’d be okay discussing that with you if you want? @notanotherzerofan Well we do know they’re *ahem* breeding age, but we have seen that their parents appear to be much bigger than them with Prozac, Crack and Nerd’s mothers. Young adults does work for bears given they tend to reach “maturity” at 3 to 4 years and get fully grown between 5 and 10 years (Black bears and grizzlies respectively). Considering Vanity is suggested to be almost childish in his stature and he’s only 2 years younger than Vanity, it would make sense if the bears were between ages 3 and 5 at this point. Idk if its just me but I ship lech and gay. I think they look cute I really dont know :v. Like opposites atracct or something(?). And how gay gets worried(?) for lech, theyre getting along better. I ship it and I love it……. Get ’em Letch. If I were you I would give them this paraphrase: “The Pride comes before the Fall”.